The 2015 International Day of Cooperatives theme was equality, with the slogan “Choose cooperatives, choose equality”. 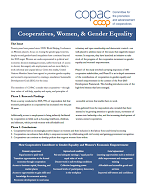 To highlight the contributions of cooperatives to equality, COPAC prepared a policy brief outlining the issue of gender equality, the status of women in cooperatives around the world and the findings of recent research on women in cooperatives. The report was developed by Dr Fiona Duguid and Dr Nadya Weber for COPAC.